The book "Foods That Harm Foods That Heal," identifies tuna and eggs as two of the top protein sources to include in your diet. Tuna offers key nutrients, such as B vitamins, iron, magnesium, niacin and potassium. Eggs are plentiful, inexpensive, easy to prepare and full of vitamins. Including tuna and eggs in your diet offers many nutritional benefits, but you still need to eat other healthful foods as part of a balanced diet. Muscles, organs, antiobodies, hormones and enzymes are all composed of protein. The chemical processes in your body rely on getting an adequate amount of protein in the diet. Animal products, such as eggs and tuna, are the best sources of complete proteins in that they contain all eight essential amino acids. A typical serving of tuna supplies up to 15 grams of protein. One large egg offers 6 grams of protein. The nutrient called lutein is found in eggs and helps you maintain healthy eyes. Eggs contain about 215 micrograms of lutein. Lutein makes up a part of your retinas, the nerve-rich tissues in your eyes that detect visual information from the enviroment. It functions by filtering out harmful wavelengths from indoor light and natural sunlight. Eggs are one of the best sources of a nutrient called choline. In "The 150 Healthiest Foods on Earth," Dr. Jonny Bowden claims choline is essential for cardiovascular and brain function. Choline also prevents fat and cholesterol from accumulating in the liver. 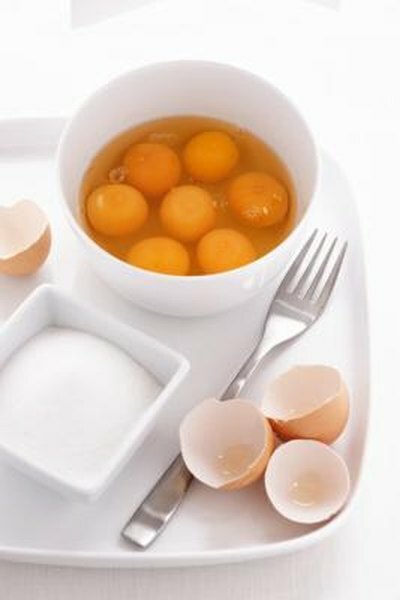 People are told to avoid egg yolks because they are afraid of cholesterol. However, the choline in the egg yolk actually prevents raised cholesterol levels. One large egg provides about 147 milligrams of choline, while a serving of tuna contains 25 milligrams. Both help you reach the recommended daily intake of 425 milligrams for women. The bacteria salmonella is a new health concern raised about eggs. It was formerly found when a cracked shell allowed the bacteria to contaminate the insides of the egg. According to the University of California at Berkeley, salmonella is now being found in clean, uncracked eggs. Wash the eggs before cracking them to avoid infection. Eggs must be cooked at high temperatures to destroy the bacteria. Soft-cooked, sunny-side-up fried eggs, or recipes made with raw eggs, such as Caesar dreesing or eggnog carry the risk of salmonella. While tuna and eggs make healthful additions to your diet, you should consume them as part of a balanced meal plan that also contains whole grains, legumes, fruits, vegetables and nuts. Eggs and tuna alone won't provide all the nutrients you need every day -- for example, they're deficient in carbohydrates, as well as vitamin C. Serve grilled tuna or poached eggs on a bed of steamed greens, and finish your meal with a side of quinoa combined with roasted or steamed mixed veggies. Are Vitamin D and Omega 3 Supplements the Same?